Shards Dashboard Lite provides 1 dashboard and 6 basic templates to serve as a starting point for your project. Each template has its components styled individually in its own “self-contained” partial SCSS stylesheet. This way you can choose exactly what template styles you want to keep or take out and recompile the kit to minimize its footprint. The styles for each template are located inside the styles/scss/templates directory. The styles for blocks common to multiple templates are located inside the styles/scss/templates/_common.scss partial SCSS file. In the example above, next to the .main-sidebar and .main-content component classes there are also grid specific classes depending on the current layout structure. For more details about the content structure please refer to the Blocks and Plugins page. 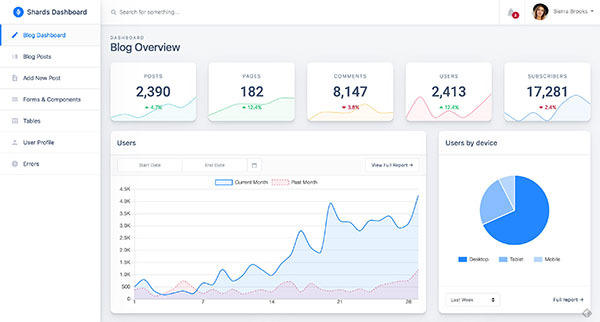 The Blog Overview dashboard template provides content blocks for content management systems and personal blogs. Users (over time) report bar chart block. Users by device pie chart. The styles for the Blog overview template are located inside the styles/templates/_blog-overview.scss partial file. The scripts for this template are located inside the scripts/app-blog-overview.js file. 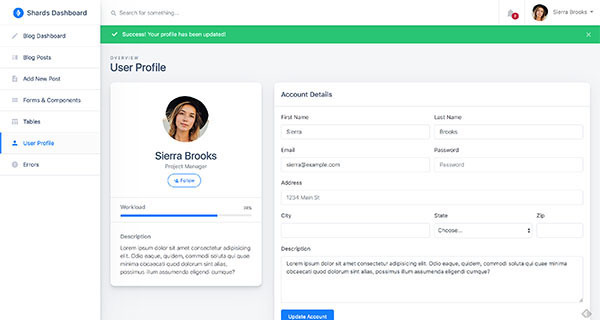 The User Profile (Lite) Template displays information about an application’s user and its activity on the site. For a more complex User Profile template, make sure you check out Shards Dashboard Pro. The Add New Post Template provides basic blog forms, components and a WYSIWYG editor powered by Quill. 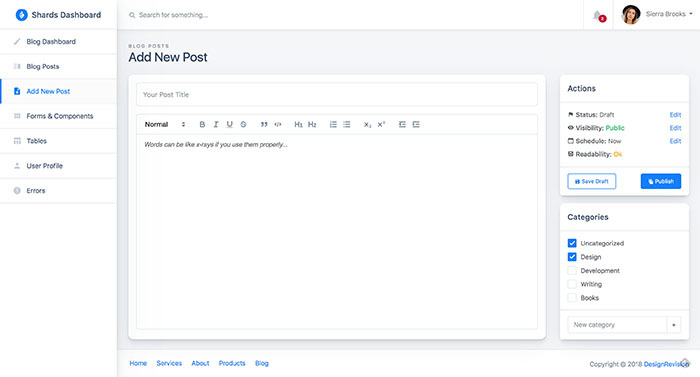 Add new post form / editor block. The styles for the Add New Post template are located inside the styles/templates/_blog-add-new-post.scss partial file. The scripts for this template are located inside the scripts/app-blog-new-post.js file.